Evaline Stoker and Mina Holmes never meant to get into the family business. But when you're the sister of Bram and the niece of Sherlock, vampire hunting and mystery solving are in your blood. And when two society girls go missing, there's no one more qualified to investigate. Now fierce Evaline and logical Mina must resolve their rivalry, navigate the advances of not just one but three mysterious gentlemen, and solve murder with only one clue: a strange Egyptian scarab. The stakes are high. If Stoker and Holmes don't unravel why the belles of London society are in such danger, they'll become the next victims. The sister of Bram Stoker—Oh, and guess what? They're Gardella descendants!—and the niece of Sherlock Holmes teaming up. Yep, a concept any female reader is sure to find intriguing. Throw in a mystery threatening the young ladies of London and a dash of time travel and the story starts off with a decent premise. Non-consecutive chapters with Mina Holmes and Evaline Stoker as the focus give a deeper look at each individually and yet somehow make them feel less like a team. While Evaline's status as a Venator makes her a bit more physical, Mina is rather cerebral which is far from surprising. What is surprising is how minimal scenes with Mina really deducing anything are only sprinkled in, I expected her to be just a bit more on her famous Uncle's level. The plot itself is painfully slow, something I always struggle with when I read Gleason's work. It's interesting with elements of time-travel and steampunk flavoring the mystery and I was eager to see our young heroines unmask the villain. Alas, the mystery is unresolved! Great if you want to slog through a series to find out all of the answers, bad if you went in expecting each novel would have its own mystery that strengthens the friendship of the heroines. Bah! So much potential that just didn't get reached. What did work for me was the somewhat romantic subplot. Three different gentlemen become enmeshed in the adventure, each unique and fun to read. I do enjoy a good love interest to keep things interesting and these guys serve that purpose very well. I also enjoyed the cameos from Bram, Sherlock and Dr. Watson, they definitely make it worth the read. 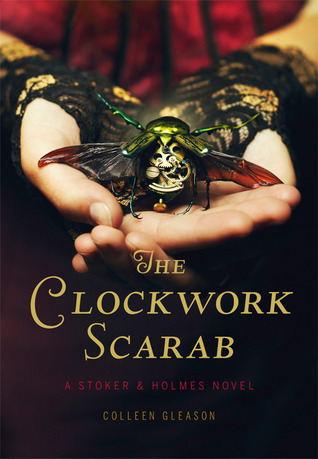 Sadly, there was a lot I didn't like about THE CLOCKWORK SCARAB, largest of all the inclusion of the Gardellas. Some fans of Gleason's might love that aspect but I felt like it cheapened the story. The ending left pretty much everything unresolved and if that kind of thing drives you as batty as it does me you'll want to throw the book at the wall. While I could only rate this as an okay read the target young adult audience will probably like it much more unless they have similar woes to those I mentioned. I'll probably give the series one more book to win me over since I still adore the concept and want to see if it can rise from the issues I had with this opener. It does! It was so frustrating that it fell short on the elements that make flesh for a premise. It's definitely one of those first in a series books that disappoints but could easily be built on in subsequent novels. It happens sometimes and some of my favorite series started with books I was 'meh' on so I will give it one more to see.